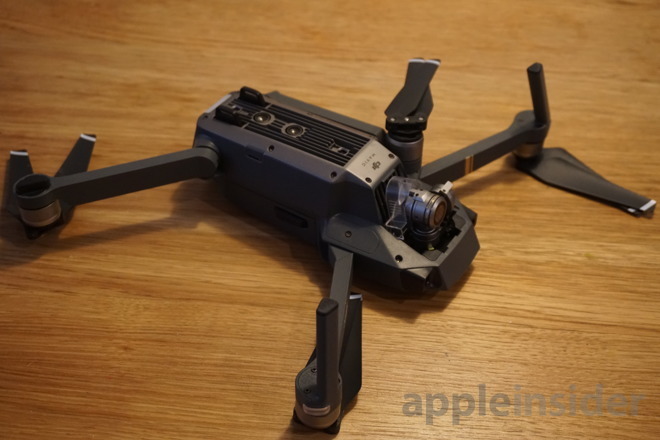 When Mavic Pro was announced last year, DJI introduced its most portable "flying camera" platform to date. 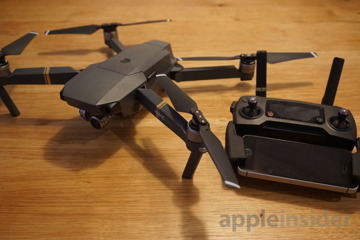 Unlike the company's flagship Phantom lineup, Mavic boasts a unique foldable form factor that allows pilots to toss the drone in a small bag for take-it-anywhere portability. 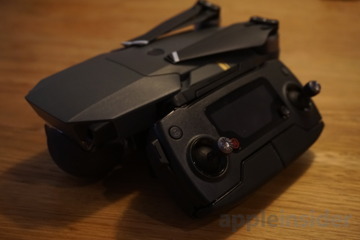 Add to that a high-quality 4K camera with low-distortion optics mounted on DJI's proven 3-axis gimbal system, extended range thanks to a proprietary transmission system and energy-dense battery, and Mavic becomes much more of a tool than a toy. Mavic represents DJI's push into truly portable drones, a strategy being pursued by a number of competing manufacturers including GoPro. Rather than shrinking down existing technology — though there is a bit of miniaturization when it comes to certain components like stators — DJI opted to rejigger the quadcopter layout into something better suited to on-the-go carry. Like common drones, Mavic's operating guts reside in a central chassis that connects to four motor booms. Instead of fixed arms, however, DJI designed foldable units that, when closed, lie flush with the main housing. The two forward arms flip out horizontally, while the rear booms rotate down and out. Unfurled, the diagonal length excluding propellors is 335 millimeters, slightly smaller than the Phantom 4's prop span. Positioning of the arms is staggered to allow for maximum compactness. Extended, the booms lend to an already aggressive looking profile, with rotors spinning just millimeters away from the chassis. The front pair of booms feature legs (with integrated antennas) for landing which, when the arms are open, give the unit a measure of nose-up tilt. The propellors are also foldable — they unfold automatically during engine startup — to make Mavic's footprint as small as possible. 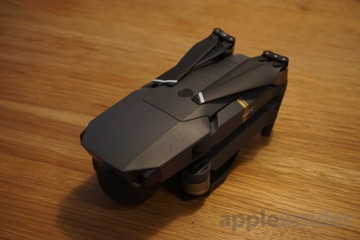 There are a few drawbacks to Mavic's folding arm design, the most notable being an inability to easily access ports located on either side of the drone body, including a small flaps that protects a manual linking button and Micro SD slot. Also obstructed is a micro USB port for retrieving data from the onboard flight recorder. Getting to the Micro SD card, which stores camera footage recorded during flight, requires the unfolding of both right arms. The design decision is somewhat unfortunate for a drone designed to be stowed with all booms in their closed position. That said, users will never have to worry about losing media cards during transport. 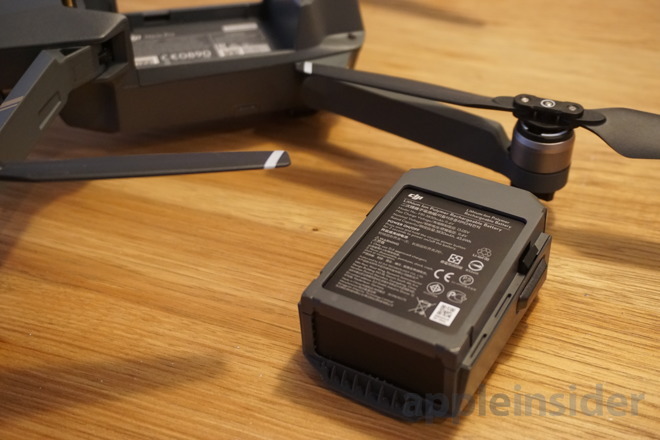 The battery pack, which DJI refers to as an "intelligent flight battery," is also inaccessible when the top two motor booms are folded shut. Push-in detents positioned to either side of the battery enclosure attach to bosses inside the top portion of the drone body. To get to the actuators, however, users have to flip out the forward rotor arms. Since the battery needs be removed for charging, basically after every flight, the action of unfolding the booms will become second nature. DJI estimates flight time at 27 minutes on a full charge, a statistic we found fairly accurate in zero wind situations and light computational demands. Add a breeze and a user with heavy thumb and flight time drops precipitously to 20 minutes or less. Moving to the camera, DJI designed Mavic to carry a modified 3-axis gimbal in its nose. Whereas Phantom and Inspire deploy their respective camera systems in a belly payload configuration, Mavic's arrangement makes a bit more sense for an ultracompact flier. The camera-forward design does have its drawbacks. For example, pan operations are severely limited in comparison to Mavic's larger siblings — completing a 360 degree pan requires operators to translate the entire drone in a circle. Though it's not as fast-moving as a servo-driven gimbal motor, the solution works well enough and the resulting footage is silky smooth. As for Mavic's functional bits, the drone implements a series of onboard sensors that inform motor speed. Two static forward-looking cameras are embedded on either side of the main gimbal-mounted camera, offering precision measurements within a 60 degree field of view out to 49 feet and general object sensing from 49 feet to 98 feet. The nose-mounted cameras also help Mavic perform assisted braking functions. Monocular sensors are embedded in the undercarriage alongside an ultrasonic transmitter and receiver array for downward-sensing and positioning. These bottom-mounted sensors allow the aircraft to maintain in-air position without help from GPS. Developed for indoor environments, the system worked well in our tests, though uniform surface textures and sound-absorbing material like carpet impeded precision. Mavic comes with a newly styled remote controller that is almost as small as an iPhone. A built-in LCD screen presents critical flight data like speed, GPS lock, RC signal strength, battery levels, distance, height and more. Folding out the remote's arms, which include an integrated Lightning connector, creates a cradle for an iPhone or other smart device. It should be noted that the grip extends over an iPhone's home button, making it difficult to operate, especially for iPhone 7 devices. The downsized remote manages to integrate just about every function included with the large white controller that comes with the Phantom. This includes two adjustable dials for camera settings and gimbal control, two shoulder buttons, two configurable rear buttons, multi-function face buttons, flight mode switch, return to home button and more. As can be expected, stick feel is similar but not as precise as DJI's bigger remote. The sticks themselves are slightly shorter than usual, but sport a thick rubberized barrel and deeply textured caps to avoid slippage. We tested Mavic in a range of environments, both over land and sea, and the drone performed as advertised. For an ultracompact drone, it was surprisingly easy to fly in all but the most dicey of situations. Out of the box in "P mode," general flight characteristics are comparable to the latest Phantom models, if not a bit more agile thanks to a streamlined design much lighter overall weight. With a lower mass than full-size drones, Mavic is extremely responsive to throttle controls. Flip the physical "S mode" switch and the drone turns into a high performance — and high fun — machine. A slew of software and hardware features help flights run smooth. Aside from the aforementioned onboard sensors, Mavic boasts an array of flight programs that mix GPS guidance with manual input, automated flight modes and even computer vision. 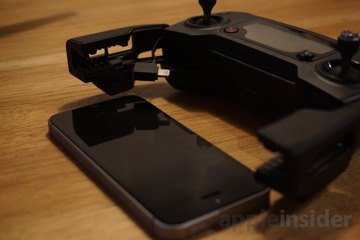 Like other DJI drones, users can connect their iPhone to Mavic's remote controller for tap-to-fly functionality, routing, top-down map views, real-time positioning data and more. After calibrating the drone, simply start the motors with a combination stick command (CSC), push up on the throttle and Mavic hovers in place. DJI put the meat and potatoes of Mavic's intelligent flight software in its iOS app. From here, users can plot courses on a satellite image of their surrounding environment, track drone movements and view realtime hardware information. A number of controller functions are replicated as onscreen controls, including important features like automated take off and landing. Users can toggle between fullscreen views of the map or a realtime feed from Mavic's camera. In tight areas like city streets and amongst trees, we found the picture-in-picture view to be too small for navigation even on an iPhone 7 Plus. In less restricted locales, such as open fields or the ocean, minimizing the realtime feed to bring up a fullscreen map view is ideal. This is especially true when flying Mavic at maximum range or its built-in altitude limit. On the topic of max range, DJI introduced a new transmission system with Mavic called OcuSync, which boasts an advertised transmission distance of 7 kilometers in optimal conditions. We were able to take our test drone out to more than one kilometer without any discernible drop in control response or video throughput. It definitely could have gone much farther, but we were unwilling to chance an errant disconnection. Even when the drone does lose connection, not all is lost. 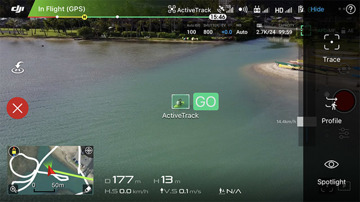 Mavic sports a failsafe return to home feature that, when triggered by a signal dropout, uses GPS and way finding technology to autonomously navigate back to its takeoff point. Users can also activate return to home via a dedicated physical button on the remote, taking the guesswork out of piloting the drone back from a trip. Mavic's smarts don't end there. 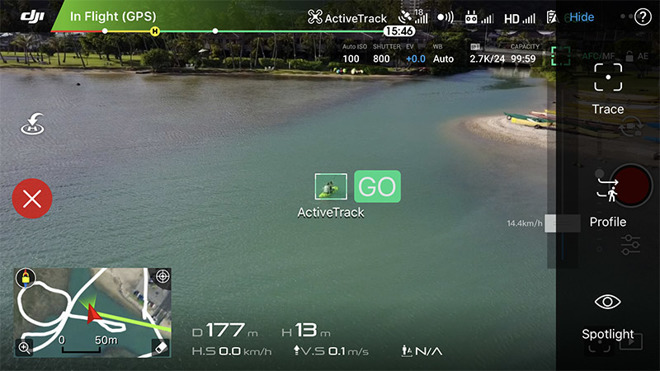 The drone boasts an ilk of computer vision called ActiveTrack that lets users select a person or object for continuous tracking. Mavic automatically tracks, circles around or moves with a target selected using tap gestures on iPhone. 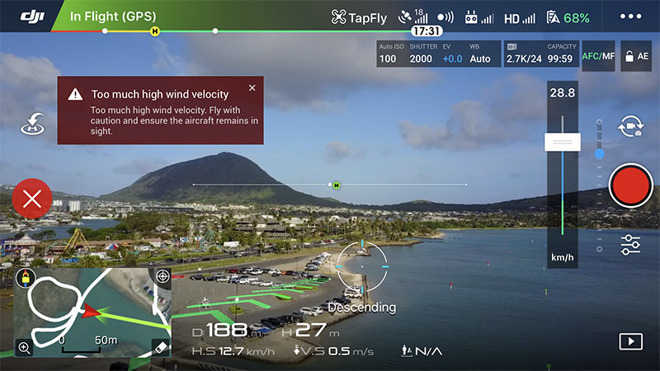 With Mavic focused on a subject, users are free to take control of aircraft movements, allowing for the creation of unique compositions. In our tests ActiveTrack easily recognized human subjects, cars and even pets, but had trouble locking on to oddly shaped objects like a kayak. Once a target was acquired, however, Mavic was able to perform tracking functions out to a distance of roughly 50 meters. Mavic lacks the ability to predict object movement, which means visual obstructions cause the camera to lose track of subject, then snap back once it is reacquired. 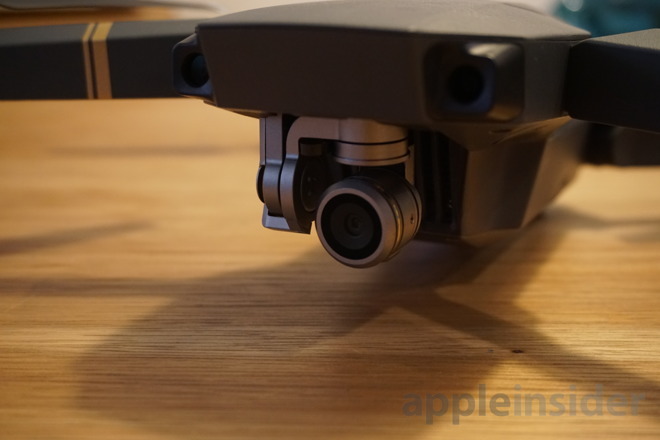 Like other DJI drones, overall stability is great, if not rock solid, and Mavic's onboard gimbal keeps footage nice and smooth in almost any situation. Mavic did have problems when we took it to an extremely windy gully between two mountain ridges. With buffeting gusts coming off the peaks, Mavic had trouble keeping to a GPS plotted course. Further, the gimbal was working overtime to compensate for unpredictable aircraft pitch, resulting in shaky footage. High winds also affected Mavic's precision landing feature. With its two downward-facing cameras, Mavic scans takeoff area terrain features and attempts to match those features during landing. We had to manually override return to home to avoid landing in a precarious location. Flying in high winds is not recommended, however, and the test was only conducted to see how Mavic would perform in extreme conditions. Picture quality from Mavic's 1/2.3-inch sensor is just as good as Phantom 3, with great raw color rendition and minimal artifacts. That being said, there are obvious tradeoffs to be made when shrinking down a camera platform. Detail and contrast lag behind stablemates with larger camera modules offered with newer Phantom 4 models, for example. Prospective buyers should not expect the same level of detail, color and low-distortion output offered by DJI's Phantom 4 Pro. That drone features a 1-inch 20-megapixel sensor with mechanical shutter, and is perhaps the best consumer flying camera on the market. Integrating what the company has learned with products like the Phantom and Inspire series, DJI has created a truly portable personal flying camera platform in Mavic. With an easy-to-use interface, no-hassle carry and advanced automated features, the product is a serious play at bringing drone technology to the masses. There are a few downsides to balance out the good. 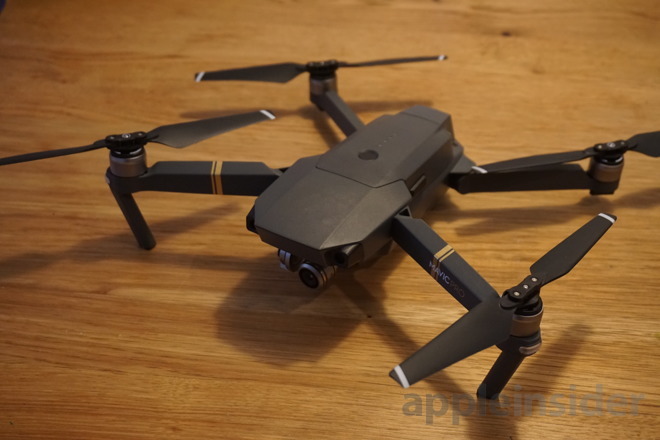 For one, Mavic's flight time, while among the best in its class, is still below 30 minutes, meaning users will likely want to carry an extra battery or two just in case. Extra batteries mean more things to carry and added weight. Price is, as usual, an issue with cutting edge devices, and Mavic's $999 price tag is its biggest hurdle toward wide adoption. For what buyers get, however, we argue the price of admission is worth it. The Mavic Pro can be purchased from DJI directly for $999.00 with free shipping and tax included. Shoppers can also pick up the Mavic Pro at B&H and Adorama for $999.00 with free expedited shipping and no tax outside NY and NJ.